I really like all the carmans range, especially this muesli bar. Carman’s super berry muesli bars a great snack to have at home and work that is healthy and it tastes amazing,a good brekkie option when running late! Carman’s Super Berry Museli Bars are the best you can get. They are made from the best ingredients. Carman’s are the only brand I will buy and eat. 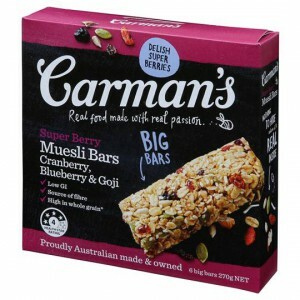 We do like to eat a variety of museli bars in our household and we have eaten these super berry muesli bars by Carman’s.- good muesli bar taste. I tried this product recently because I had a vegan guest at home and this is a vegan product. Very tasty, in the perfect Carman’s quality! How would you rate Carman’s Super Berry Muesli Bars?